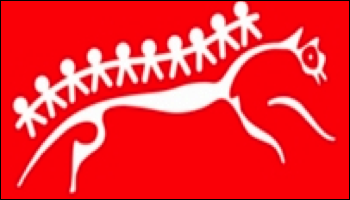 Welcome to the DrumBeats web site which provides an introduction to our work with schools in and around Oxford and a useful central location for existing students and parents to pick up and request information. DRUMBEATS NEW COURSES IN SCHOOLS…look out for email updates! New term Drum Timetables for term 5, 2018-19 are now posted on website - look out for email info. School lessons start during week beginning Tues 23rd Apr. Please note that you will be emailed once the timetable for your school is available but not sent a copy. Instructions on how to download your copy of the term's timetable will be included with email. Direct link to timetables here. If you need help, please email or call. Saturday sessions, 10.00-15.00: Apr '19. 14.30 available weekly, & please ask - off timetable & 'cover' slots may be available and usual 'floating' post-lunch lessons available if you are happy with booking week on week. Holiday drum lessons and recording sessions - look out for more holiday sessions! Click on holiday session tracks to hear what we've done before. Hit ‘play’ or start first track and listen through the ‘playlist’…..
It’s as easy as that! Just like recording your first hit track! Look here or email here if you want to try the next recording sessions. 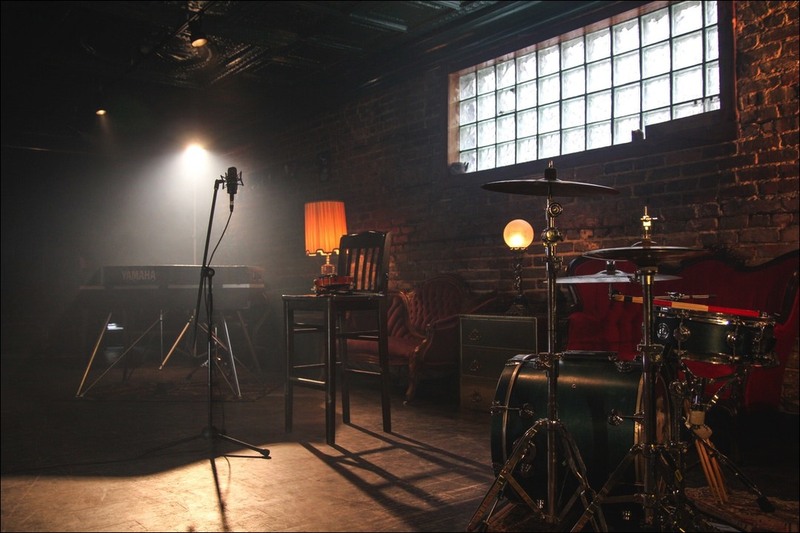 How to upgrade your acoustic kit or get a practice pad for less! Reuben Spyker sets off on a mission to gather all sorts of cheap alternatives to give your kit a different sound. Check out this Drumeo.com video! Parents often ask which Primary & Secondary schools we teach in. Click here to see the list. NEW SCHOOL - Wolvercote Primary, Oxford. DrumBeats were invited in to school to run intro lessons for both guitar & drums which have been a huge success. Lessons are ongoing in drums & guitar! Contact here for more info re lessons at this school or to see if we can provide sessions at your school too. NEW SCHOOL - Warriner Secondary, Bloxham. DrumBeats were invited in to school to run intro lessons which turned out to be a huge success. Lessons are busy but please contact here for more info re lessons at this school or to see if we can provide sessions at your school too. DrumBeats will be back teaching drums at 'Phil & Jim's' soon so WATCH THIS SPACE! We offer starter courses and group or individual lessons. OK, he didn't play the drums, but Albert loved to play violin in his spare time! Apparently, you should add drum lessons, or maybe another instrument, to your weekly schedules, to help grow your brain's neurones/connections. It all has an effect on the 'corpus callosum' which effectively joins the two hemispheres of the brain. Learn an instrument, whatever age, and you can 'light-up' and expand this area of the brain! Good to run alongside your academic or work activities to keep your brain finely tuned! 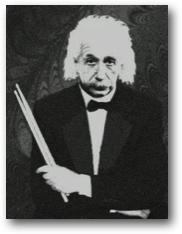 New study claims that drummers are more intelligent than….. everyone!?! ….well, maybe everyone else in the band! The news comes from a joint Harvard & Oxford universities study. But it’s also backed up by researchers in Sweden who found that drummers who kept a tighter rhythm scored better on a 60-question intelligence test. And, If that wasn’t enough, other studies added that rhythmic music actually makes people smarter. Wow! That should make all us drummers feel happy! Well, it had to happen…DrumBeats had to push the Oxford City boundary and take on the wilds of Oxfordshire! We ventured to Wantage and found a not just one but three schools which were massively keen to take on the new DrumBeats short course for drums & guitar for their children, years 2 - 6. Of course, there was a storming demo to help get things rolling which met with enthusiasm from both pupils and teachers! We are already upping the numbers of drummers & guitarists in the south of the county, teaching at Charlton, Wantage and Millbrook Primarys. A big thank you to all the music coordinators in these schools for helping us launch the DrumBeats shortcourses. Contact here for more info or to see if we can provide sessions at your school too. DrumBeats runs term of drum kit short courses at Stanford in Vale Primary…. DrumBeats run drums & guitar lessons at Stanford so look out for information via school & pick up an app letter from the school office! Last year we started teaching beginner drum courses for children in years 2 - 6. We were overwhelmed by interest and have been teaching at Stanford now for 2 years and are training up a great bunch of beginner drummers! After DrumBeats' success in tutoring at a number of Wantage primary schools, we are really pleased to be invited in to King Alfred's secondary to continue lessons with all years to 6th form. We already have a number of our primary school children back in to lessons and happy to provide continuity between schools with their DrumBeats drumming! St Aloysius inspiring children to play drums & guitar! Elaine & Tom are now running drums & guitar tutoring here and already have a waiting list of students ready to start! DrumBeats are always starting new courses at St Aloysius. Contact here for more info or to see if we can provide sessions at your school too. Drumming is in headlines again! Developed by Apple, this is my current favourite iPad app. It is a total music workstation allowing the user to sequence from built-in synths, keyboards & samplers. It has a great drumkit which you can play 'manually' or create variable loops of rhythm using a 'rhythm grid'. It also has bass, acoustic & electric guitars, all of which can be played manually or automatically picked/strummed. Finally, it comes with a bunch of recorded loops to add in to your mix. Once you have recorded your masterpiece, you can even export it to the Mac desktop version of GarageBand. A review can be found here or go straight to the Itunes Store. What's the DrumBeats recommended drum book? 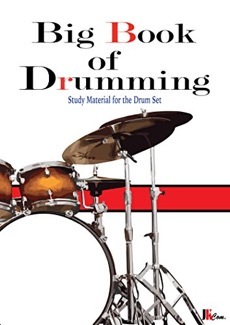 Got to be the 'Big Book of Drumming' by Jake Summer. This is a 450-page selection of rhythms and fills, from starter to intermediate/advanced, and covering a large range of styles. Loads to keep you busy! Cost £2.50 on Kindle…..unbelievably good value! DrumBeats launches new starter groups teaching drums at St Barnabas'. We offer starter courses and group or individual lessons. 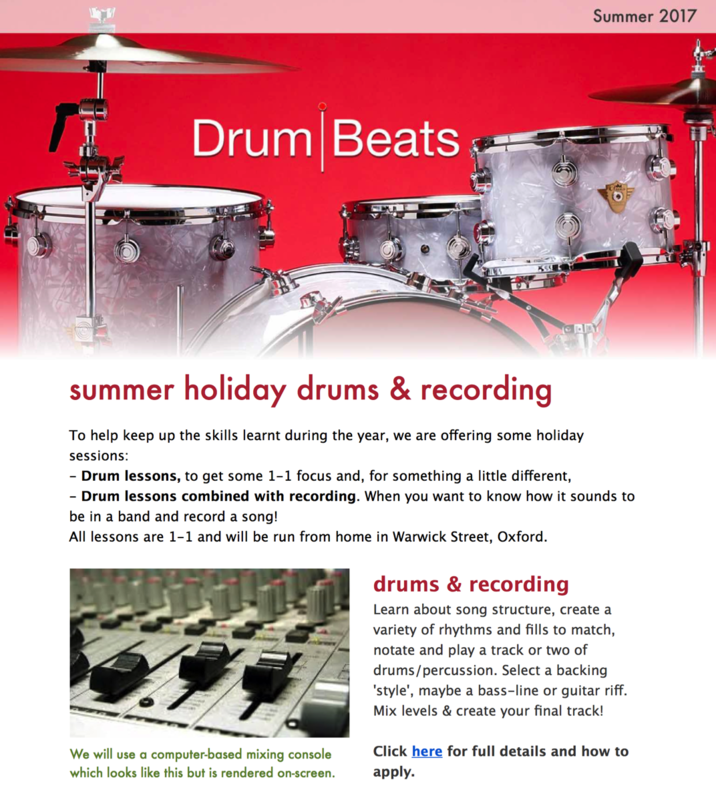 DrumBeats runs term of drum kit short courses at St Joseph's Primary, Oxford…. DrumBeats running new starter groups teaching drums at St Joseph's. We offer starter courses and group or individual lessons. 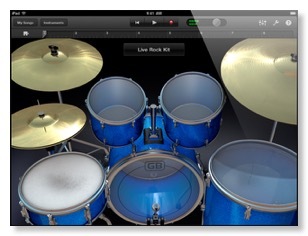 Searching for Electronic drum-kits? Check out the latest recommendations…..
DrumBeats already runs its popular Summer Rock School and has run weekly Rock Schools too. Now, we can provide one-off group /band mentoring, helping get your groups of friends or serious musicians together and make music! We've already run several short sessions in and around Oxford. After a demo earlier in term 1, we were welcomed in to St Joseph's Primary to run 6 weeks of starter drum courses for children in years 2 - 6. We were overwhelmed by interest and are now well underway with our short course. We continue offering lessons at school and so contact here for more info or to see if we can provide sessions at your school too.